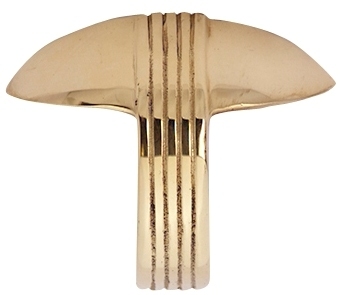 2 5/8 Inch Overall (2 Inch c-c) Solid Brass Art Deco Pull (Polished Brass Finish) - each pull is constructed from solid brass and is finished by hand. Each pull measures 2 5/8 inch wide by 1 5/8 inch tall and can be mounted either upright or inverted. This product comes as an un-lacquered natural brass and it will patina over time. A high strength lacquer coating is available upon request. This style of Cup Pull mounts with two machine screws (included) and it has a center-to-center mounting distance of 2 inches. This pull has graceful lines and coordinates well with our Art Deco Skyscraper line of products.